Akela’s Council – Have you been yet? Have you heard of Akela’s Council? Have you been to Akela’s Council? Do you know a Cub Scout leader who would benefit from attending this great training? This is an exciting 3 1/2 day Cub Scout Leader Training for those who want to have a better understanding of the Cub Scout Program and how to create the best possible Scouting experience for the boys and families in their packs. This fast-paced, hands-on training covers all recent changes in the Cub Scouting program and will inspire you to want to “Do Your Best”. Here are a few articles we have had from a few different Cub Scout Leaders and their personal experiences with Akela’s Council. Akela’s Council Helped Fix My Pack! Akela’s Council; The BEST Cub Scout Leader Training Ever! The one thing that they all have in common is that Akela’s Council is great and well worth the time and money to attend. It is hands-down the best training for Cub Scout leaders and it was created right here in the Utah National Parks Council. In 2017 there will be 2 courses and registration is open now! HOW did Akela’s Council start? In 1984, the Utah National Parks Council Cub Scout Committee decided there was a need to have further training for the Cub Scout Leaders in the Utah National Parks Council. A committee was formed to decide what was needed. They wrote and rewrote and revised and rewrote many different classes for leaders to learn the Cub Scout program to its fullest extent. In May of 1987, the first course was held at Camp Maple Dell with 28 participants. It was 4 1/2 days long. Every night at staff meeting the staff would revise the program again to make it work for the participants. It was because of these pioneers of the program that the course was successful. After each course, there were a few changes to help the program fill the needs of future leaders. When new programs were developed by national BSA, they were incorporated into the program. Not only did participants learn more than they ever dreamed, they also came away with a deeper conviction to the program and friendships to last a lifetime. AkelasCouncil.com has information about past courses, upcoming courses, history and a list of things you will learn at Akela’s Council. It also has a link to its own blog with lots of craft and other great Cub Scouting ideas. UNPC Council Website has information on the upcoming courses including who to contact for more information, how to register and even how to get to camp. If you would like to talk to someone personally about Akela’s Council they will have a booth at the upcoming University of Scouting (Feb 18, 2017) with fun ideas, prizes and information too. Author: Annaleis Smith has been a Cub Scout leader for over 13 years. She first attended Akela’s Council in 2007 (AC23) and was on staff for a number of years after that. She was the Cubmaster/Course Director for AC31 in Sept of 2015. Having been to A LOT of different trainings, AC is her very favorite! We know that a Scout is true to his family, friends, Scout leaders, school, and nation. To end tonight, I want to focus on being loyal to his nation. One of the greatest examples of loyalty to nation can be witnessed in a cemetery. This inscription is found on the Tomb of the Unknown Soldier in Arlington National Cemetery. The Tomb Guards are so loyal that there has been a guard there every minute, of every day since July 1st, 1937. This includes during times of war, the September 11th attacks, and natural disasters such as Hurricane Sandy. All precautions are taken to ensure mission accomplishment and soldier welfare at all times. Each move made during the changing of the guard and during their “walk” is very specific, choreographed, and done in respect for those they are guarding. The Tomb Guard marches 21 steps down the black mat behind the Tomb, turns, faces east for 21 seconds, turns and faces north for 21 seconds, then takes 21 steps down the mat and repeats the process. After the turn, the sentinel executes a sharp "shoulder-arms" movement to place the weapon on the shoulder closest to the visitors to signify that the sentinel stands between the Tomb and any possible threat. Twenty-one was chosen because it symbolizes the highest military honor that can be bestowed -- the 21-gun salute. Depending on the time of year, the guard is changed every 30 or 60 minutes. 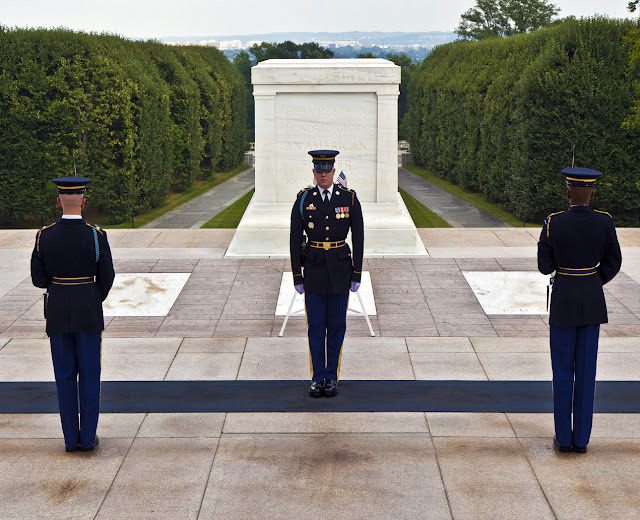 The soldiers who are serve as sentinels for the Tomb, display loyalty in a way that, although we do not ask our Scouts to replicate, they can still emulate by showing loyalty to our country through respectful and well executed flag ceremonies and other events that honor our nation. Thanks to Felice Clements for donating this idea. She is Cubmaster in the Hobble Creek District Community Pack 1456, Utah National Parks Council. 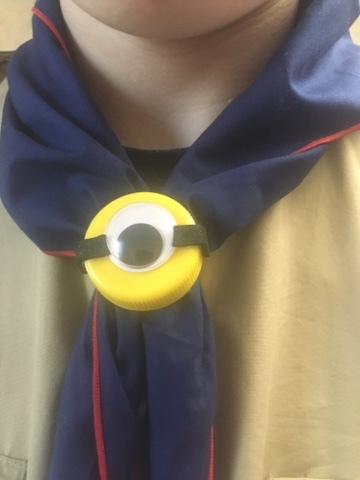 Who doesn't love minions, well, for you Cub Scout leaders try on this fun and simple neckerchief slide. 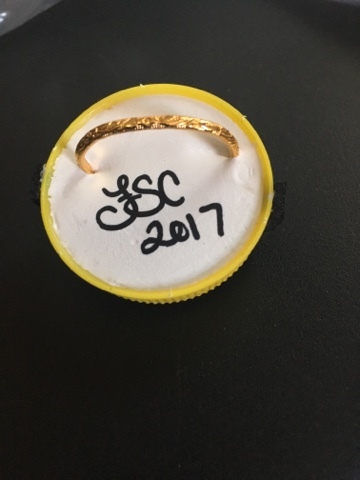 All I used was a yellow milk cap that I poured plaster into the back and put a party favor wedding ring in, I let it set for about a day. 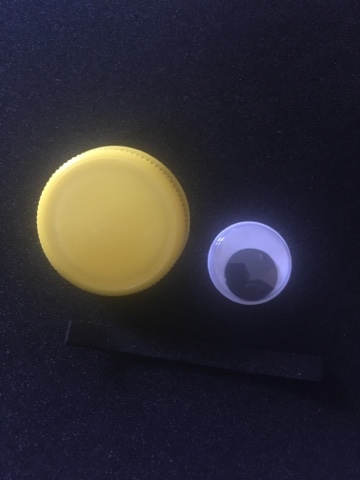 Along with the yellow milk cap, I used a big googlie eye that I bought in a variety package from Dollar Tree, and then 2 thin strips of black fun foam. 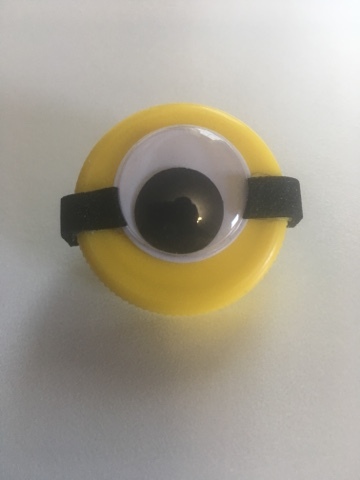 I hot glued the eyeball down where I wanted it, and then glued each piece of fun foam, gluing from the eyeball back, and trimming any excess away! Done! Get your boys excited about uniforming!!!! Neckerchief slides can be one way to do that!